From left to right: Nestor Montoya, responsible for Corporate Banking of Attijariwafa Bank, Sayd Farook, responsible for Thomson Reuters Islamic Capital Markets, Ángel José Del Río, Commercial Division of Aresbank, Daud Vicary Abdullah, president and CEO of INCEIF y José María Fuentes, director of Kernel Investment Group Investments. Cordoba, Spain, March 30th 2015. 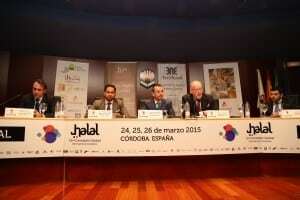 The 1st Spanish International Halal Congress held last week in Cordoba, asserted the importance of knowing your customers financial models and stood out Islamic Finances as an alternative to traditional banking for the Spanish SMEs. “A Spanish SME, can’t afford a non-payment”. With this categorical statement the moderator of the panel on Islamic Finance Ángel José Del Río, Commercial Division of Aresbank, expressed one of the main concerns of small and medium-sized businesses in Spain which, although familiar with exports are often unfamiliar with the Islamic countries financial system. “You have to know your customer, where is he and how is he: And that means knowing how he finances his company, his methods of payment and, as a result, how will you be paid”, points out Del Rio, whose bank does not offer Islamic banking products, nor operates under the model of Islamic finance due to the actual regulation in Spain, which does not allow it. Nevertheless it counts with sister banks in many Muslim countries. Nestor Montoya, responsible for Corporate Banking of Attijariwafa Bank of Morocco, agrees on the needs to know his customers methods of payment. He explains that in commercial transactions with African and Middle Eastern countries it is still very common to use of letters of credit as payment, which is unusual when exporting to European markets. “The letter of credit not only assures the payment, it is also useful for the applicant: the client knows that the goods will be delivered on time, quality and deadlines are assured”, he added. One of the characteristics of Islamic Finance is to be based on trust and respect. When a contract is signed both parties must be in equal conditions and share the same risks, although one of the best known features of Islamic banking is that it do not apply interests, which are not allowed by Islam. Investing on related to gambling or alcoholic beverages is also forbidden. Sayd Farook, responsible for Thomson Reuters Islamic Capital Markets in the United Arab Emirates, believes Islamic finances is a promising market. “The prospect of Islamic countries populations’ economic growth is comparable to India or China. The birth rate is higher (than ours) and we are talking about a very young population who becomes part of the working population” while European population is aging, which drags the economy, indicates Farook. “85% of Muslims considers that their religion is very important in order to take a decision, opposed to 30% in Europe and 49% in the States” he adds, stressing that religion influences in their transactions and types of consumption or production. The United Kingdom is the leader of banking and Islamic finance in the Eurozone. In order to achieve this position the UK has changed its regulations, while countries such as France and Germany are currently exploring the possibilities. “I always look to the United Kingdom, his ‘no obstacles but no favours view’”. His ability to attract and implement alternatives to the traditional market. And if the United Kingdom does it with success and Germany and France are looking into it, it is a matter of time to make it possible in Spain”, explains Del Rio. Jose Maria Fuentes, director of Kernel Investment Group Investments in the United States, stresses that there are already initiatives to change this regulation. Fuentes says that Spain is late in this issue, that there are differences within the legal framework and much more bureaucracy than in other countries, but that conversations have already been initiated with the Government, the Central Bank of Spain, the ICEX or multilateral institutions, among others. When we talk about Spain, we are not just talking about financial services for the Muslim populations living in the country, but also about Spain becoming the centre of Islamic finance in the Mediterranean. “Due to our strategic position, good relations with the Arab countries and our tradition, Spain has to be a hub for Islamic finance in Latin America. It is the only thing that we can take away from the British. No one can take from us our relationship with Latin America and the Mediterranean countries”. How to connect the dots between the Islamic Finance industry and the Halal industry, was the conclusion raised by Daud Vicary Abdullah, president and CEO of INCEIF, Malaysian University specialised in Islamic Finance. “It is very important that Islamic Finance is connected with the Halal objectives (…) and that we change the way they are perceived”, explained in reference to the negative connotations that have for a certain audience terms such as Sharia or Islam. “During last year, the Halal concept is being treated by the media with greater rigour, being more consistent with its real meaning. Halal has gone from being included in news about terrorism or violence to make headlines in the economic section of the main media and in specialised media in tourism, ecology or gastronomy”, explains Laure Rodríguez, Halal Institute director of Communication.